Questo libro di cucina ben illustrato ci introduce alla vera Italia. Francine ha raccolto una serie di ricette che provengono de giovani blogger come da anziane nonne di piccoli e remoti paesi, da importanti produttori di dolci italiani, tra cui Bauli, Corsini e Falanga, ma anche da alcuni famosi cuochi italiani. Da migliaia di ricette ha selezionato il meglio: un elenco che comprende sia i classici dessert che i dolci contemporanei preparati oggi nelle cucine italiane. 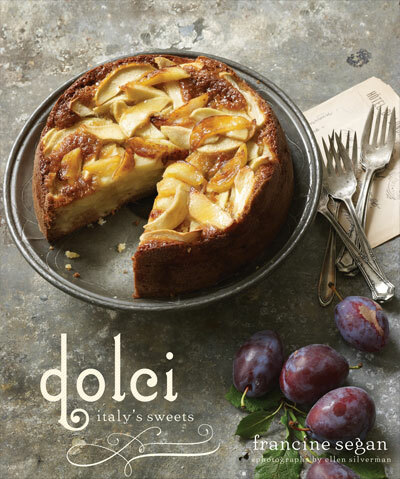 "Dolci: Italy's Sweets" has a rustic feel that starts with the cover and brings you inside on a trip around the country. From desserts to homemade liqueurs, everything is beautifully photographed. In all there are 125 recipes, some for seasonal Easter or Christmas desserts. All recipes have stories, but the ones with Segan's transport you to the countryside. How can you not love a book that has a recipe for chocolate eggplant?" "Francine Segan, is a true Renaissance woman." "Segan's new cookbook, Dolci: Italy's Sweets, reassures Americans that Italian desserts aren't as gluttonous as restaurants perceive them to be (think: Towering Napoleons). Instead, Segan asserts that true Italian desserts are about simplicity and highlighting wholesome ingredients." "In this beautifully designed cookbook, veteran cookbook author Segan presents more than 100 recipes for Italian desserts. The author culled recipes from various regions in Italy, providing cultural notes and crediting chefs, restaurateurs, and historical cookbooks for their origins. Even those with a shelf of Italian cookbooks will delight in the chapter featuring dolci particuloari, a collection of "Weird and Wonderful Desserts," including hair pasta pie from Emilia-Romagna. A swoon-worthy title for those with a sweet tooth and open to expanding their dessert repertoire."